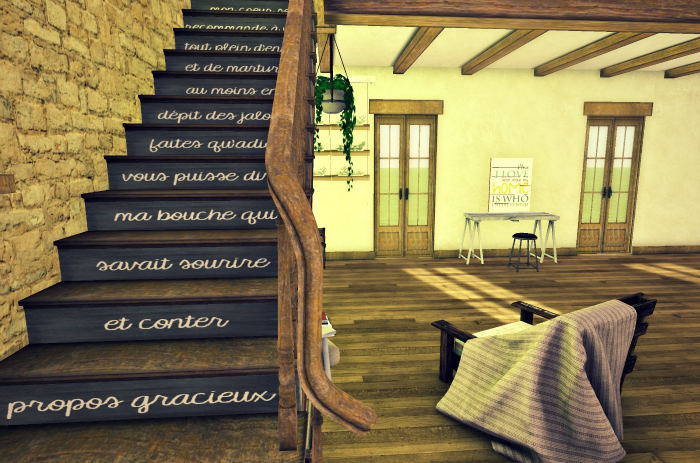 Apple Fall has made a beautiful set for Shiny Shabby (which is now open!) 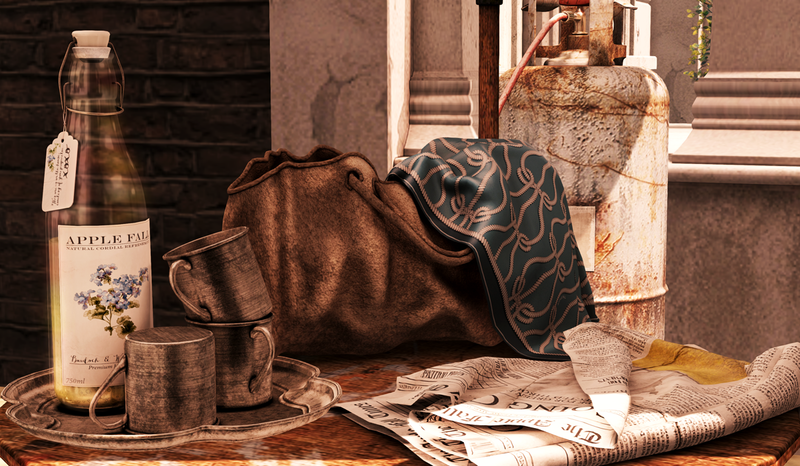 It comes with Chairs, a table, table accessories such as a tray with drinks, a wrinkly newspaper, and a purse with scarf. There is also a propane tank. The chairs have seven poses (made by Apple himself) The buildings that I used in the background are also made by Apple Fall. The cute little scooter in the pictures is one from Kalopsia which is at The Liaison Collaborative right now. My sisturd, Sienia stopped by and had a nice little chat with me. 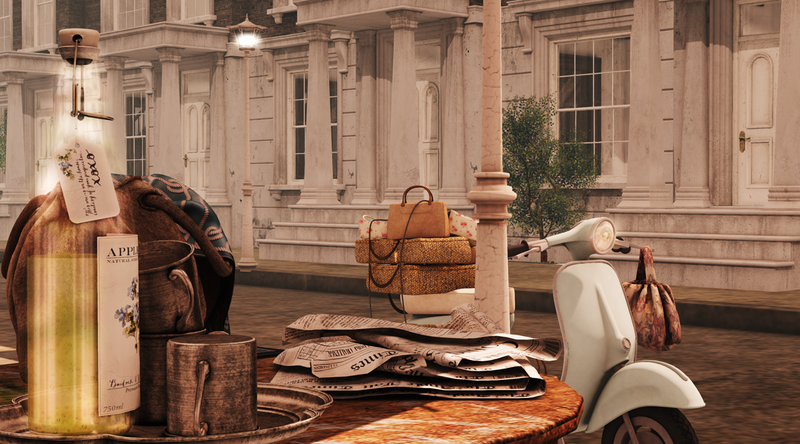 She is wearing stuff from Shiny Shabby – the M.Birdie outfit and the hair from Tableau Vivant. I’m wearing Little bones Fifty Linden Friday hair today and a dress from Tee*fy. Have a great Friday! Mountain winds sound exactly like ocean waves. You are worth everything now. The sun always rises (and is always beautiful). There is music in everything. You don’t need to choose mediocre when fire exists. The moon orchestrates our nights and tides. Trees can grow through rock. Your heart expands when it’s broken. You should do it now. Let’s pretend that I posted this a few days ago. I have been sick with a bad cold and well my blogging has gotten pushed back a bit. Sways has this pose prop out for Fifty Linden Friday today and it has room for four people to take a picture on it but I just used my own pose from Adorkable to stand in front of it, and added some balloons from Tres Blah and a Champagne bucket from Keke. With all that being said, I hope it’s a great year for you! Hi it’s Friday! Many important things start today (like Orange is the New Black). One of them though are these cute little Broccoli companions that you can get from MishMish for Fifty Linden Friday, yes! That is correct get your own broccoli’s for just 50L folks! But seriously, I love these little guys. I am also wearing hair from Truth, Skin from Glam Affair (Romy), A shirt from Tee*fy at Collabor88 and shorts from Mon Tissu. I am also wearing a bracelet from Izzies and a pose from Flowey! There was this vanity set from Lark – which came with a dressing stool, vanity table, slip on a hook, hat boxes and even a glove box. I see that set everywhere now and I just love it. Sienia did a wonderful job on it! There was also the little jewelry box from MishMish that has a spinning ballerina in it and plays a song and this heirloom hutch from Pilot. I am also wearing the lingerie from guest designer Steffen Garcia. There is still time for the January round of Collabor88 so get to it! I am also wearing new hair from Magika and shoes from Gos Boutique. My pose is from oOoStudios for Fifty Linden Friday today. 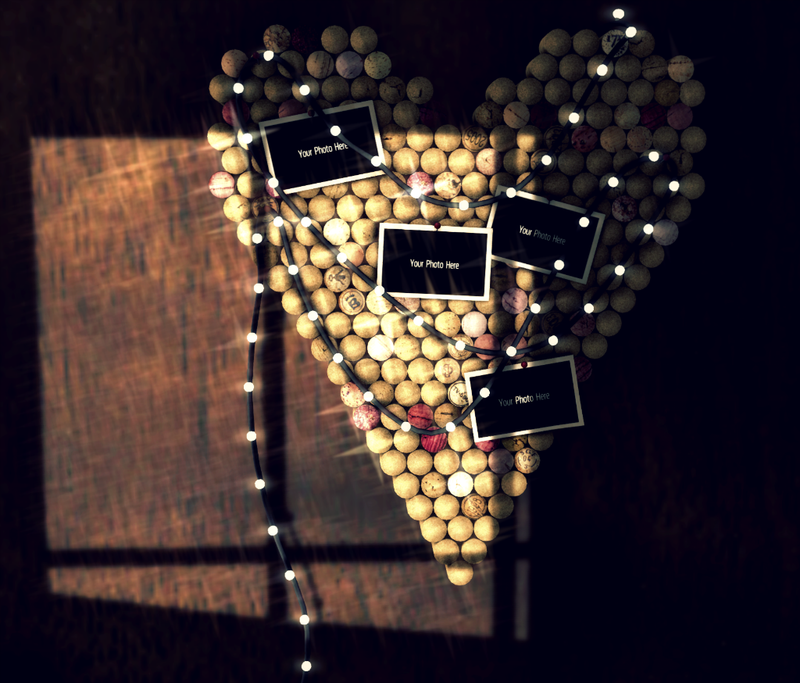 Fifty Linden Friday is for lovers, vino lovers. Debuting in FLF this week, Sienia Trevellion of Lark made this cute heart shaped cork board for your walls. It also has four places for photos (that it’s really cool you just add all your pics to the contents as many as you want and you can click and the photo appears as if by magic!) and it already has string lights for you so you don’t have to worry about hanging them. 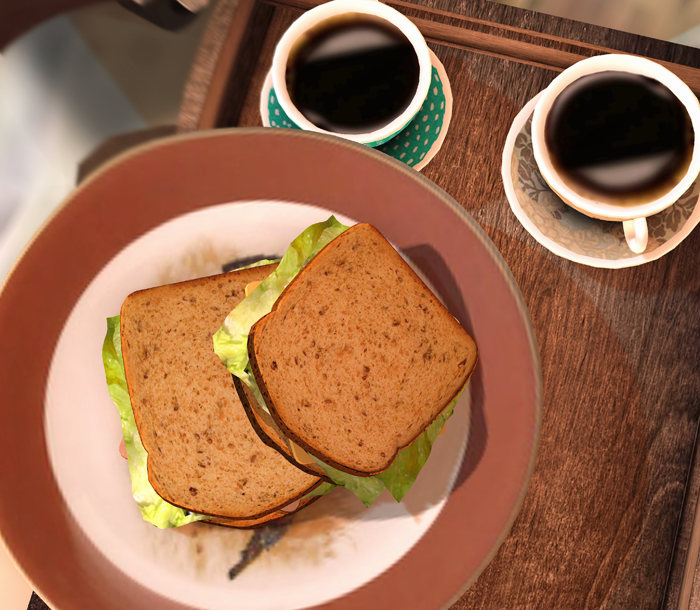 The whole thing is only four prims too and you can steal it today for only 50L. The Home Show is coming! The Home Show opens on July 1st and I was able to get a preview of it and there is so much exciting new home and garden stuff, it’s going to be amazing! I’m wearing the really cute dress from Miel that is a fat pack for only 50L today for FLF. Also, Magika is having a sale and everythign is half off! My flip flops are from Gos Boutique. So, have you been enjoying the Four Walls Hunt? I know that I have. I love love love hunts that feature home stuff and so far this has been one of my favorites. I mean who can beat the prices as well, 20L for some of this great stuff? Crazy! 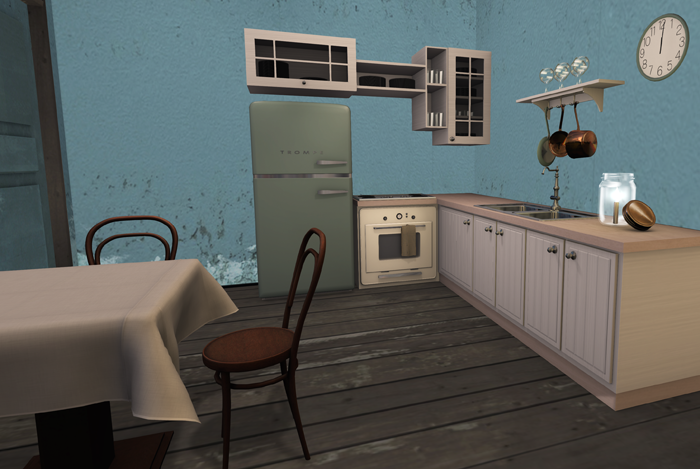 In this post I have stuff from Mudhoney, Pilot, Cleo Design, Cheeky Pea, Vespertine, Abiss and Digs. I totally love how I can just sort of throw everything together and it looks so nice, many of the items of mesh and very low prim too. Seraphim SL even made a cool gallery here: http://seraphimsl.com/2013/01/20/four-walls-hunt/ You can look at all the items separately. In this post I am wearing a beautiful 70L Skin from Al Vulo that is at the Dressing Room Fusion. The Mesh Purse in my hand is new from Glam Affair. I’m wearing brand new hair from Mister Truth Hawks, A new long sleeve shirt with my Lolas from Izzie Button of Izzies, and pants from Boom that were on sale for Fifty Linden Friday. My jewelry is from Cae (Cae is Fifty percent off this week at Truth District!) and Yummy and my poses are from Purple Poses.